Blinky Palermo and Gerhard Richter, Two Sculptures for a Room, 1971, wall paint, oil paint on bronze, oil paint on wooden pedestals. 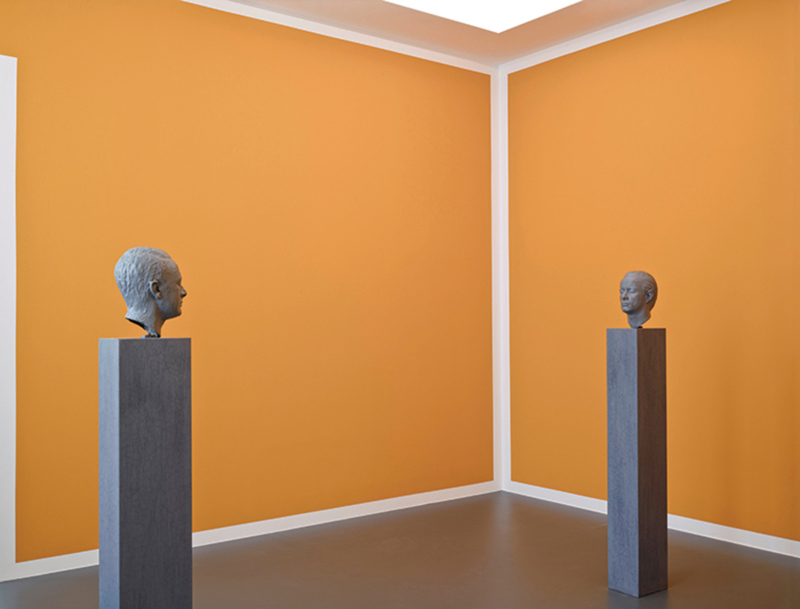 Installation view, Städtische Galerie im Lenbachhaus, Munich, 2013. © Blinky Palermo/Artists Rights Society (ARS), New York/VG Bild-Kunst, Germany. Formalism and Historicity: Models and Methods in Twentieth-Century Art, by Benjamin H. D. Buchloh. Cambridge, MA: MIT Press, 2015. 592 pages. Traditionally the viewer was lulled into passivity by the paintings on the walls. Our construction/design shall make the man active. . . . With each movement of the viewer in space the perception of the wall changes; what was white becomes black, and vice versa. Thus, as a result of human bodily motion, a perceptual dynamic is achieved. This play makes the viewer active. Not just the literal midpoint of Buchloh’s book, Lissitzky’s passage can be understood to crystallize the volume’s analytical heart as well. For if the Russian describes a desire to awaken viewers’ critical capacities through his material reformulation of artistic workmoving from the production of discrete objects to integrated environments, following a paradigm not of static presentation but dynamic activationso Buchloh has long sought to rouse his readers by articulating a model of historical inquiry driven by the twin engines of critical negativity and utopian anticipation, and motivated by a primary concern with the radically shifting conditions of possibility by which art in the modern period has been repeatedly redefined. If the demonstration rooms proposed a fundamentally collaborative aesthetic model in which isolated authorship was rendered obsolete, so Formalism and Historicity departs from Buchloh’s 2000 essay collection, Neo-Avantgarde and Culture Industry: Essays on European and American Art from 1955 to 1975, in focusing not on individual makers but on historical repetitions (figuration, portraiture, the monochrome) and episodes (the development of Conceptual art and the interwar Soviet avant-garde, as well as the latter’s postwar reception) that cut across the span of twentieth-century art. In his discussion of Lissitzkypart of the seminal 1984 essay “From Faktura to Factography,” an early touchstone in English-language scholarship on Soviet modernismBuchloh homes in on a fundamental contradiction in the artist’s demonstration rooms: Their radical reformulation of the conditions of aesthetic reception was nevertheless realized within an institutionthe museumthat remained committed to exactly the passive spectatorial model and aura-driven interpretative framework Lissitzky’s installation designs sought to overcome. The primary subject of Buchloh’s essay, accordingly, is Soviet artists’ efforts to move beyond such historical limitations, a developmental sequence pithily encapsulated in the paired terms of its title. It’s not just the works themselves that concern Buchloh, then, but, more broadlyand above alltheir entwinement and engagement with shifting epistemes of cultural production and distribution, as well as the evaluative criteria historians have brought to bear upon all of these. Any cultural analysis worth its name, he stresses throughout the volume, must develop its criteria “from within the actual intentions and conditions” motivating the projects it considerswhich, in the case of Lissitzky and company, means not only jettisoning blanket modernist conceptions of pure form and absolute authorial sovereignty, but also focusing on artists’ attempts to delegitimize precisely these shopworn notions. If such claimspertinent, of course, far beyond the Soviet contextseem old hat today, it’s to a great extent due to Buchloh’s pioneering work in the ’80s, the decade during which all but three of the essays collected in Formalism and Historicity were written. The dates are not insignificant. Buchloh’s new volume traces his attempt to chart particular passages in, and challenges to, the twentieth-century avant-garde’s long interlacing of political utopianism and critical aesthetic practice during a decade seemingly committed to their amnesiac eradication at the altar of neoliberal orthodoxy and speculative pseudo-avant-gardism. (As well as, it must be said, a decade in which new forms of politically engaged work proliferated, from that of Group Material and the Guerrilla Girls to David Hammons and Jenny Holzerthe last of whom makes it into the book’s pages.) To those of us for whom Buchloh’s writing of the Reagan-Bush years was absolutely formative, Formalism and Historicity is thus triply illuminating: It assembles foundational historical texts and chronicles the development of their author’s own thinking, while collecting in a single volume the essential seeds of our own critical maturation. For this reviewer, it was probably 1981’s “Figures of Authority, Ciphers of Regression: Notes on the Return of Representation in European Painting” that, back in the day, had the most powerful impact. Weaving between Carlo Carrà and Christian Schad, Francesco Clemente and Georg Baselitz, the essay sought to ask (first in the pages of the then five-year-old journal October) “to what extent the rediscovery and recapitulation of . . . modes of figurative representation in present-day European painting . . . cynically generate a cultural climate of authoritarianism in order to familiarize us with the political realities to come.” Heavy (and heady) stuff, with several Buchloh keywordsrecapitulation, cynical, authoritarianismthick in the mix. What made the essay’s analysis so compelling, and fuels its continued urgency, was its dexterous explication of present cultural debates’ entanglement with past stakes and practices, coupled with an insistence, suggested by this volume’s title, that form has a historical responsibility. While we can quibble with some of Buchloh’s generalizing movesGino Severini’s figuration is worlds away from that of Kazimir Malevichthere’s little arguing with this essential motivating claim, or with the assertion that its denial serves only to reduce artistic style to the ideological equivalent of the commodity and to enforce critical discourse’s regression to mere babbling in the service of spectacularized entertainment and profit-driven accumulation. Nowhere, for Buchloh, were these stakes clearer than in the ’80s adulation heaped on the Neue Wilden and Transavanguardia, whose ahistorical embrace of “eternal” aesthetic norms betrayed a looming atavism that reached far beyond artists’ studios and collectors’ walls. The volley most often hurled at such analysis is that it ultimately rings like latter-day Greenbergianism, its insistence driven by a conviction of aesthetic form’s teleological necessity that rivals that of the earlier critic. So an artist like Jeff Wallof whom Buchloh was an early backer but whose turn to large-scale tableaux he has since called “overwhelmingly spectacular . . . Wagnerian”warrants not a mention here (nor, for that matter, in Buchloh’s earlier essay volume), despite their shared historical and theoretical investments. (The lineage out of which Wall’s practice emerged, however, is definitively diagrammed in the signal essay “Conceptual Art 1962–1969: From the Aesthetics of Administration to the Critique of Institutions.”) But while Buchloh’s work is clearly indebted to Greenberg’s model, it’s not that of “Modernist Painting” (1960) but to that of “Avant-Garde and Kitsch” from two decades prior (whose title Buchloh echoed in naming his own earlier collection), in which the older critic seeks to trace the dialectically interlocked and socially determined development of his essay’s paired title terms rather than to advocate, as he would later, for the inexorability of “opticality” as a fully dematerialized, and socially immune, culmination of painterly destiny. One of the great rewards of reading two decades of Buchloh’s work in a single volume is witnessing, across a century’s worth of historical material, the sheer range and perseverance of his attempt to redeem, and extend, Greenberg’s early project. Hence Buchloh’s repeated concern with returns and repetitions; for him the issue is not the seamless progression of a medium but artists’ specific responses to shifting conditions of production, reception, and distributionresponses in which the very idea of medium is often stripped to its barest material boneswith all of these developments understood to be imbricated within, but not beholden to, particular sociopolitical formations. The critic’s job, for Buchloh, is to work against such mythologizing operations. It is, accordingly, Barthes, along with Walter Benjamin (to whose theorization of allegory, Buchloh writes, Barthes’ writing provides a “historical sequel and a structural analogue”), whose critical voice most animates Buchloh’s arguments, along with the two MarcelsDuchamp and Broodthaerswhose work plays an outsize role within them. Both artists, one in the wake of Cubism and the other in that of Pop, pursued just the sort of “artificial myth” that Barthes describes as our lone weapon against myth’s all-encompassing force: a practice of counterrobbery that seeks not to step outside myth’s operation (for any attempted removal duly becomes its prey in turn, as just so much fodder for an ever-hungrier culture industry) but instead accepts and adopts as its essential subject the necessarily mythical status of art itself. As Buchloh writes of Broodthaers, he sought a practice that recognizes “the dialectics of memory and critique, or . . . of refusal and withdrawal on the one hand and the inevitable process of acculturation on the other” as the ground of any avant-garde or neo-avant-garde project worth its name. Buchloh’s introduction, published in part in these pages in 2012, plaintively wonders whether it’s all over now: Is critical aesthetic practice, much less criticism itself, even possible in an era characterized by “a never-ending fluidity of utter indifference and anomic flexibility,” in which de-skilling’s once-radical potential has so metastasized that it has seemingly rendered the very idea of judgment obsolete? Not yet, I’d say. For if the critic’s primary concern, as Buchloh demonstrates, is to analytically and historically situate artists’ attempts to diagram and disturb myth’s voracious appetites, there’s little risk of obsolescence. The challenge, rather, is to seize hold of the changing economy of myth itself. In the age of the first black US president and the waning of both nation-state sovereignty and the notion of an infallible market, long-held mythical constructs are fast dissolving only to generatefrom Charleston to Raqqa to the nearest Trump rallyever more violent attempts to hold onto, or reinvent, their depleted forms. The desire for mythical thinking, we’re reminded daily, is infinitely more dangerous than the individual fictions myth provides. Today’s new aesthetic practices take shape amid this terrain. However indeterminate the criteria by which they come to be judged, one thing is certain: Buchloh’s critical model, so brilliantly chronicled in Formalism and Historicity, will loom large in any worthwhile attempt at the task. 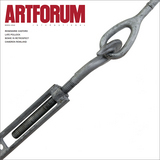 Graham Bader is an associate professor of art history at Rice University in Houston.